i3upgrade aims at the intelligent and integrated upgrade of carbon sources in steel industries through hydrogen intensified synthesis processes. 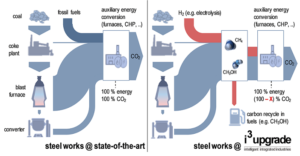 In contrast to established synthesis processes, the project targets direct methanation and methanol synthesis of by-products in steel works under dynamic and transient conditions being operated by advanced control strategies. Agent-based modelling demonstrates the opportunities for reduction of CO2 emissions in steel works in the framework of emerging volatile markets. The final proof-of-concept of the new control strategies will be performed with real bottled steel mill gases as well as with a complex gas matrix from an existing gasifier. This project has received funding from the Research Fund for Coal and Steel under grant agreement No. 800659.